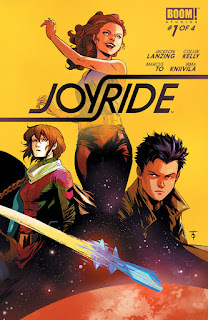 The Fellowship was fortunate enough to obtain a copy of JOYRIDE #1 from BOOM! Studios. Jackson Lanzing and Collin Kelly write, Marcus To draws, Irma Kniivila colors, and Jim Campbell letters. Uma and Dewydd have a plan: they’re going to escape fascist Earth by meeting an alien on the dark side of the Moon. The authorities claim that we’ve been at war with the aliens for years, but Uma is sure it’s just propaganda. But a local cop spots them leaving and tries to arrest them, only to get caught up in Uma’s plan to take over the starship. So the adventure is just beginning. To describe this story as “Uma thumbs an interstellar ride” doesn’t do justice to the complexity of her plan. It also doesn’t get much help from the stodgy Catrin. But it’s an exciting way to get to the stars (which none of them have ever seen before). The art does a phenomenal job with the pristine high-tech city and moonbase, but it’s really the colors that make this book beautiful. If there’s a key concept in this book, it’s hope. Uma and Dewydd are hoping they’ll find a better life outside their world, and Catrin hopes she can get back to it. Either way, you’ll want to check out this thrilling adventure. JOYRIDE #1 is available now at your FLCS or at boom-studios.com.